Our Library has some original classics and many antique books available to read. Many of these can be only viewed inside the Library and are not allowed out on loan. Please visit us in person to inquire about this collection. We also have Local, Provincial and Canadian books on the history of these areas. We offer a Summer Reading Program for children ages 3 and up. We run the summer program from July to August, dates are tentative. Pre-registration either by email, phone, in person or online is needed as we have limited spots available. 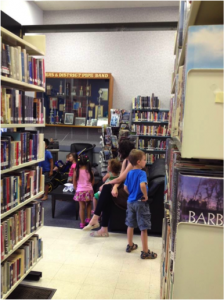 We also offer a Pre-school Storytime every Friday morning at 10:30 during the months of September to June. Pre-registration is not required, walk-ins are welcome! All registered children must have a library membership. We also have different crafts throughout the year during each program. Our Library holds special events such as book signings, Author book readings, Author appearances, Author’s special seminars, Teas, parties, fundraisers and book sales from time to time. You can find out about these events in person as we will always advertise within the Library, by phone (if no answer please leave a detailed message and we can call you back), and by email (send us your questions). Please see our Contact Us page for all contact information.